We are a family-owned small business with more than 18 years construction experience in the Richmond area. We have four generations of home building and remodeling experience in our family history. Our members follow two previous generations of builders in the 1920's in Virginia. Previous generations have built homes and businesses for members of their community and the US Army during World War II. Our business partners have detailed knowledge, experience and education in residential and commercial design, construction management, and methods of construction. These partners are highly experienced construction managers, carpenters and custom cabinet and furniture builders. We have experienced trades subcontractors who bring quality and speed to the job site because they perform the same type work every day and are good at what they do. Our staff will also be on your job to keep focus on your successful construction project - residential and commercial. Our projects include dozens of new residential homes ranging in cost from $110,000 to more than $1M in today's dollars. We have installed hundreds of kitchens and bathrooms and built dozens of additions ranging in cost from $29,000 to more than $350,000. We have also restored historical homes,(one originally built in 1804) and converted residences to office space, restored store fronts and installed commercial kitchens and handicap bathrooms. Our mission includes all types of general contracting in cost ranging from a few hundred dollars to more than $1,000,000. 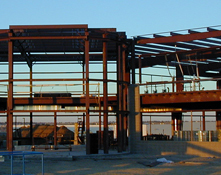 We have recently become an authorized builder for Rigid Global Metal Buildings and provide turn-key construction projects for storage, warehouse, industrial, farm and church buildings of all sizes and configurations using pre-engineered metal buildings from Rigid. We take pride in the work we do and want only satisfied customers.